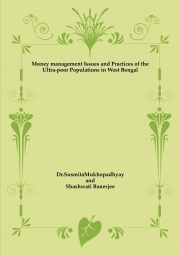 Description of "Money management Issues and Practices of the Ultra-poor Populations in West Bengal"
The book is written based on the extensive field research experience of the authors. it deals with the money management issues and practices of different ultra poor people in West Bengal , their coping strategies with the vulnerabilities faced in their daily life- importance of social capital in their life. Susmita Mukhopadhay, Assistant Professor, VGSOM, IIT Kharagpur. Awards: A gold medalist in M.Sc. from the Applied Psychology Department of Calcutta university, she is the recipient of the Young Scientist Award and Search of Excellence Award. She was selected for the Microfinance Researchers Alliance Fellow Program Centre for microfinance, Institute of Financial Management and Research, Chennai, in 2009. Shashwati Banerjee is presently a research fellow in Humanities and Social Science Department of IIT Kharagpur. She worked as project fellow in the project on Money management Practices of Ultrapoor people under Dr Susmita Mukhopadhyay and completed her MS by research under Dr Mukhopadhyay's guidance. Shahshwati got Vidya Bhavana Merit Scholarship from Visva-Bharati for being first class third in both B.A. and M.A. from the year 2006 to 2010. The author got Best Paper Award in 2012 for the research and presenting the seminar on SHG and Women Empowerment in the International Conference at Vidyasagar University. Reviews of "Money management Issues and Practices of the Ultra-poor Populations in West Bengal"